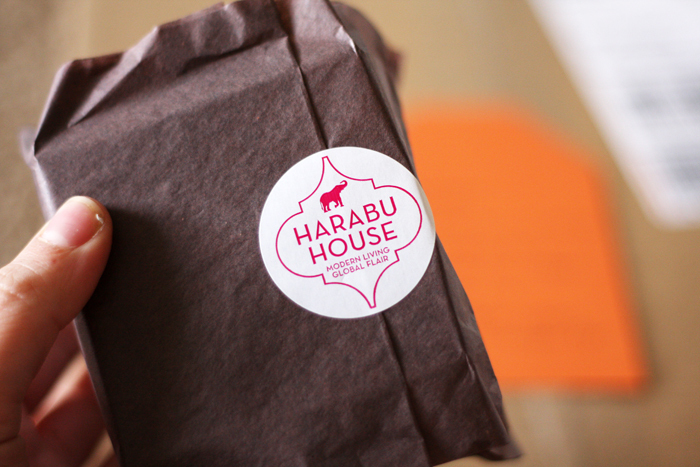 Israel was given this cute little Ferm Living cup from Harabu House last week. It's kind of perfect for his little hands and he loves the Panda Bear, he loves Pandas for some reason. Of course the most exciting thing is opening the box that was delivered to the house, he is so intrigued with the mystery of the box's contents. Anyways, he loves his little cup and asks for it all the time, drinks from it and spills plenty of water everywhere. Israel loves to play in his room, at his little desks that are right at his level. 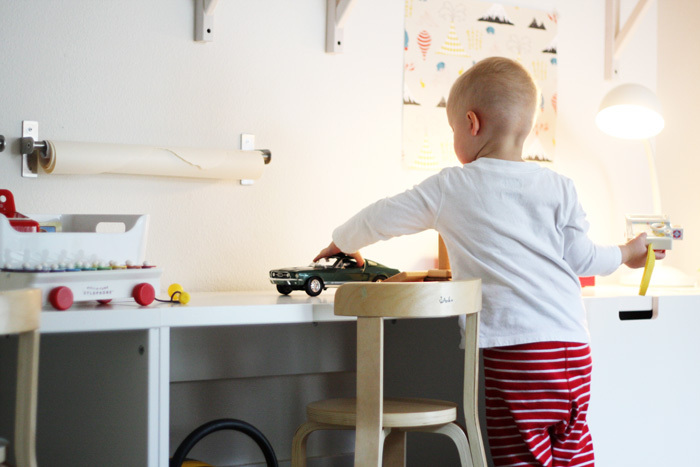 He turns on his lamp and music, colors & paints, races his cars up and down and just makes a general mess. I am not one to tolerate toys everywhere, it is very stressful for me but at the same time I want Israel to have fun and spend time playing with his imagination and not be prohibited by his mom's need to keep things put away. To solve this, I keep his toys in these white bins that are on a high shelf (somewhat visible in the 2nd photo) and take one or two down at a time. When he wants more toys down, I have him put the toys back into the bins and trade them for new ones. That way all of his toys are not out at once but he still gets to play and make a mess. I was wondering what all you other mothers out there do to keep the toys organized? Any brilliant tips you'd be willing to share? I want Israel's desk in adult size... How do you come up with these things?! I LOVE Israel's little set-up there.. I would never leave my room! 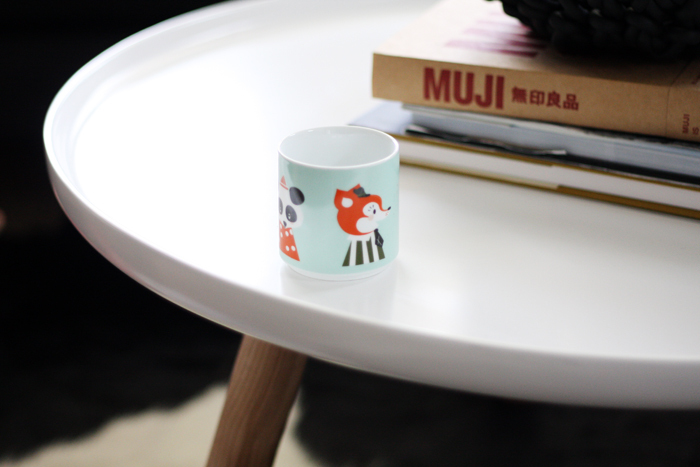 This is one seriously adorable cup. I kind of want one. I want to see a full post with pictures of his whole room! Looks cute! I have a few baskets to store my toddler's big toys and stacking containers/shelves for cars, people, animals etc, so if he does make a huge mess it so quick and easy to shove the various toys into their 'homes'. I love that cup! I quite like pandas too so maybe I will have to get one--although me holding it won't look anywhere near as cute as Israel holding it. would you please be able to share the sources for all of the lovely things in israel's room? his desk! his chair! and oh, those lovely toy bins... swoon. As a mother of three, I have learned to let go... :) We have bins and baskets for everything, and we put everything back in it's right place before bedtime, but during the day it's mostly a big mess. But I don't mind. My kids are quite good at cleaning up their toys before switching to a new game, so it's not really that bad actually. My strategy is actually quite the opposite from yours. I keep everything (toys, craft materials, books etc) where the kids can reach it. That way they can also put it back by themselves. And they get a good overview of what they have. I feel that if I would keep their things on high shelves, their stuff would be my responsibility, and I don't want that. By keeping everything at their level they can help with putting it back from a very early age, and it becomes part of their natural routine to do so. My youngest is two years old now and she is very good at tidying up, without even having to be prompted to do so. This is how we do it at our house, too. The toys are stored in their rooms so at the end of the day when they are in bed my husband and I can enjoy a few hours in the living room without the toys in sight. The thing I struggle with more than toys is art projects. I feel like I'm drowning in paintings, glued masterpieces, and sculptures made with tape and objects from the recycle bin! I'm not a big saver, and I have a small flat file for each child that I keep special pictures in, but I always feel so bad getting rid of their other creations. 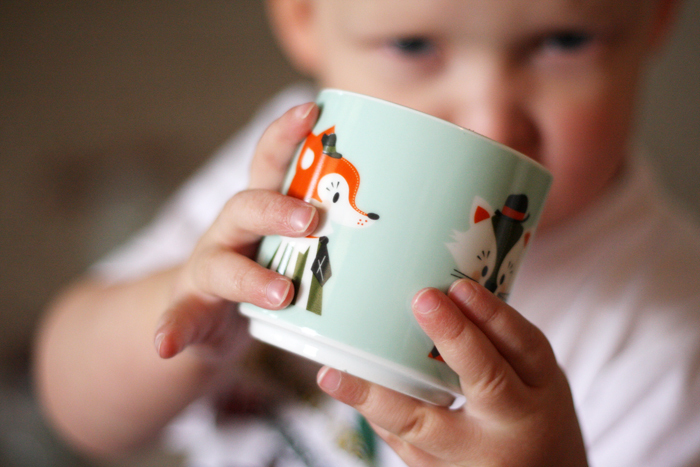 I love his sweet baby hands holding the cup...you have such a beautiful boy! Israel is so adorable, as always! I have a huge open container with the toys my 6 year old daughter plays with and it's located in her closet. This way when she is done, she can open the closet, throw all the toys she played with in the container and close the closet. Love these photographs. His room looks amazing, so clean and warm at the same time. I bet he has lots of fun playing in there. As a mom of three too, I do things quite the same as Emma. The children learn to clean up what they played with before moving on the another game and that way I keep things reasonable organized. And I throw away a lot too. If something's incomplete or broken to the point it can't be repaired, it goes out. Love the cup, we have this one, too. Concerning the toys, we tend to have very few things and the boy has to put back what he played with before taking out something else. Plus, we swap things from time to time, meaning there are never all x books, cars and bricks available, only as much as the boy himself can stay on top of. Love this idea of a craft station keeping everything all together, need to do something like this for my boys as I find sometimes there stuff just spreads across the whole house..were is the work station from ? It is super cute for the children. 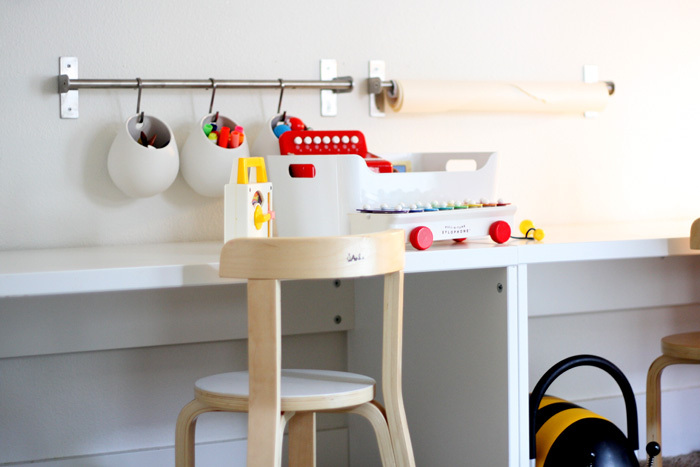 Oooh, I'm dying for another peek at this beautiful playroom! Are there photos anywhere else? And I'd also love to know who made the chairs and the desk. My daughter is 9 months old, so we are just starting to figure out the toy situation. I can already see that rotating toys is going to be a good idea! I love the chairs. Where did you find them? The chairs are from a company called Anka & I believe you can buy them from Fawn & Forest as well as Amazon. We bought them as a set, 1 table, 3 chairs & a backless matching stool (for a parent to sit at) They look a lot of Alvar Aalto chairs. VERY good to know, thank you! i have my kid's toys in their closet sitting on the floor inside bins and also I storage them inside an "adult" credenza that is in their room and serves as a changing table for my one year old. Don't like seeing toys everywhere and having my house take over by toys in the living room! I too would love to know where you got those chairs? Thanks! Jennifer, I have been searching for the perfect white paint (for my walls), and I think yours is lovely. Would you mind sharing what it is? Thank you! We're currently in a rental so it's just a basic white from Walmart. We didn't want to invest in quality paint if it's not for our place. It was right off the shelf, no mixing! than where can i select post?